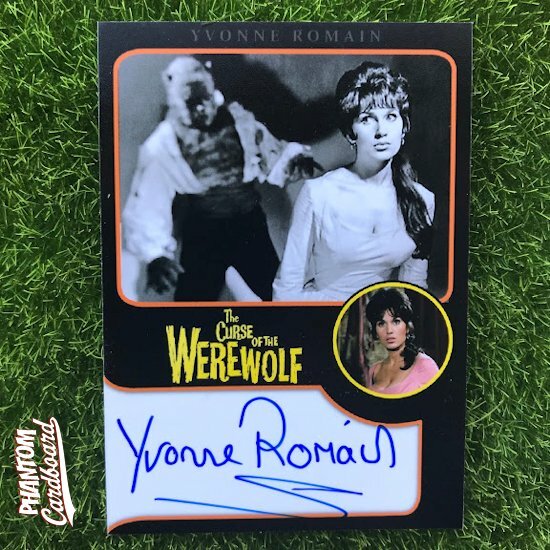 Werewolf to have signed. I thought briefly about using a 1961 Topps baseball inspired design which is the year that movie was released. That particular design is kind of plain and I wanted to try something a bit different, more like a modern autograph card. I had a design in mind from a Star Trek card I had happened upon, but I never saved the image. I went back on eBay to try to find it but I just couldn't seem to find it again so I recreated the basic look from memory. I'm not claiming to be a trading card Rain Man, but I was pretty pleased when I ironically found a card from the set again a couple of days after designing mine. If you're curious it's a Star Trek 50th Anniversary card made by Rittenhouse Archives. This next card is an image I found while looking for pictures for the Curse of the Werewolf card. I wanted to also make a card from it. I messed around with editing the image a bit until I got something that I thought looked pretty cool.